Image Below Or Add To Cart P-38 Blank Firing Gun 8MM Replica: This P-38 Replica is faithful in design to the legendary P38 Auto Pistol adopted by the German Wehrmacht during World War II. 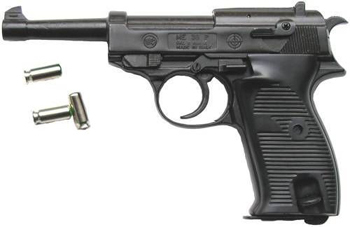 The P 38 replaced the P 08 Luger as the official German sidearm. It continued in use by West German forces long after the war. The P38 is a real Classic weapon that everybody recognizes. This P-38 Blank Firing Gun is great as Reenactment Weapon, A Movie Prop Gun, Stage Prop blank firing Pistol, Collecting or Display. It Comes Complete with a Magazine and Hard-shell Carrying Case. Length 5 " Weight 2 lbs. 6 oz. Fires 10 8 MM Rounds.